Since September is the end of quarter 3, many MMO games such as Blade and Soul, Elder Scrolls Online, Final Fantasy XIV, Guild Wars 2, and even the World of Warcraft launched their big patch updates/expansion in September or a few days before. These significantly impacted RMT market causing these in-game currencies price to be pretty fluctuated. For other games that did not have any change, their price is quite stable with less than 15% difference between the highest and the lowest price. 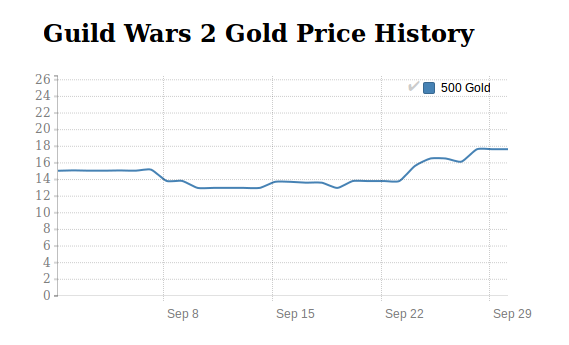 Since its price increase at the end of August, Blade and Soul Gold had been staying in the range of $1 USD per 10 gold. The price was especially high during the first week of September where it reached $1.1 USD for the same amount of the in-game currency. In September, there was much news related to the upcoming Blade and Soul patch called "Ebondrake Citadel"scheduled to release on October 5. It should cause Blade and Soul Gold price to be even higher, possibly more than $1.2 USD per 10 gold. The cheapest was on September 30, 2016, which is 10 Blade and Soul Gold for $0.89 and the most expensive was on September 5, 2016, for $1.15. There is a 29.21% difference. Elder Scrolls Online Gold price in RMT industry has fluctuated since June after the release of its newest expansion, the Dark Brotherhood. When the price started to be stable, a new patch update, Shadows of the Hist, was released in August shaking the in-game currency price again. And, again, when the price was becoming stable in September, another patch update “One Tamriel” is scheduled to release in the following month bringing a major change to the game exploration system. It caused an RMT price to rise again. 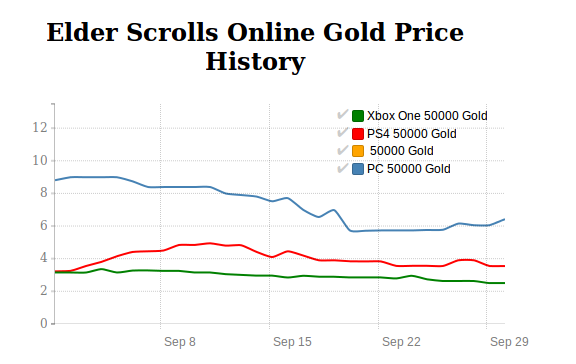 Elder Scrolls Online Gold price should be quite expensive during the first 3 weeks of October and started to decline after that. The cheapest was on September 22, 2016, which is 50,000 Elder Scrolls Online Gold for $5.73 and the most expensive was on September 1, 2016, for $8.81. The decline was as great as 53.75%. Unlike other major MMOs, Star Wars the Old Republic was very quiet in September. There was not a single game update except the announcement on PvP season 7 reward. Even the news related to the upcoming Knights of the Eternal Throne in Fall could not be found as well. Because of these, SWTOR US Credits price started to drop again. Unless there was an update on the Knights of the Eternal Throne, Star Wars the Old Republic Credits price should still be decreasing in October. The cheapest was on September 29, 2016, which is 10mn SWTOR US Credits for $5.65 and the most expensive was on September 3, 2016, for $6.55. It was a 15.93% drop. Once again, En Masse added a new costume to Tera's in-game store, and this time, it was undergarment armors such as bras and underwears. In addition, the guild system was significantly improved with the introduction of “Guilded Age”. 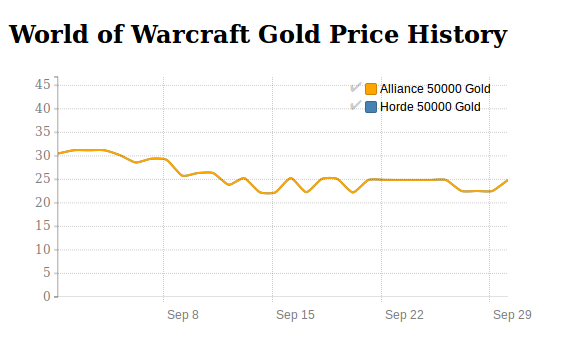 Looking at Tera Gold price history in September, its fluctuation rate was better than the previous month. However, a sudden 10% price change still happened throughout the month. Tera Gold price should be similar in October. The cheapest was on September 16, 2016, which is 20,000 Tera Gold for $25.16 and the most expensive was on September 26, 2016, for $27.96. It was a slight 11.13% fluctuation rate.